Did you know that our Wall Quotes™ decals come in 46 different colors? There's a hue for everyone-no matter what your style or taste! Today, in our Color Crush series, we're exploring a shade of blue that's moody, dramatic, and very "now"-teal! Teal is a popular color in home décor and fashion that pairs great with coral, yellow, and all shades of green. 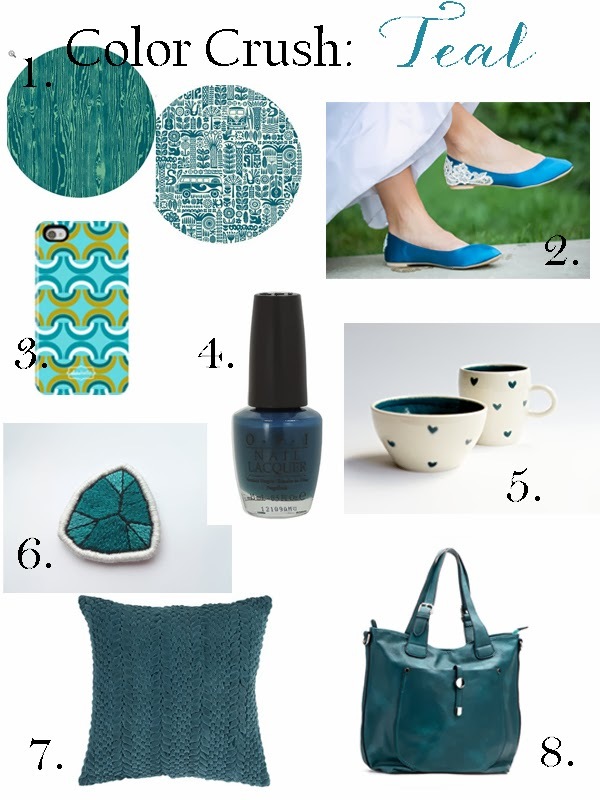 Let's explore some of our favorite teal finds! 1. Looking for teal fabric with a modern feel to create clothing, pillows, or just to wrap around canvas as art? From fabricworm, Joel Dewberry's Wood Grain Teal, and Dennis Bennett's Ipanema are two great choices! 2. These teal blue flats from Etsy are the perfect surprise pop of color under your gown. Not getting married anytime soon? These would be perfect paired with a flirty halter or maxi dress as well! 3. Graphic and bold, this Clairebella iPhone case pairs teal with turquoise, moss and white for a fun and modern statement. 4. Want to try out teal without making a bit commitment? This OPI nail color is sassy, trendy, and perfect for Spring! 5. This handmade bowl and mug set is simple and sweet! Perfect as a gift for a dear friend, sister or mom (or even yourself-we won't tell)! 6. This embroidered gemstone patch is modern and playful. Use it as a brooch to add some style to your bag, scarf, or jacket! 7. This textured pillow from Wayfair is a simple yet elegant way to add some teal-love to your home décor! 8. Made of Italian vegan leather, this handbag is the perfect way to gussy up your everyday style!